Get in the summer spirit! 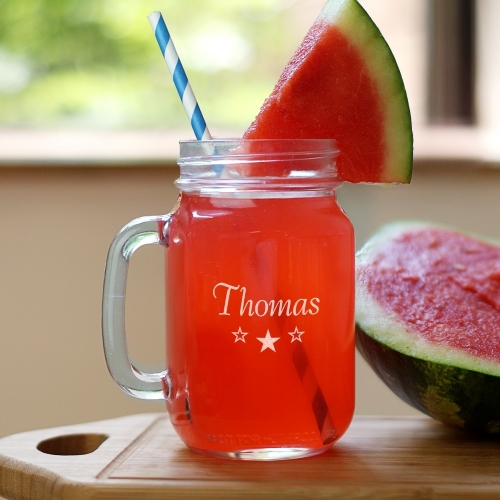 Personalized with any name (up to 10 letters) and featuring our patriotic stars design, this engraved mason jar is perfect for summer barbecues and picnics. I got this for my granddaughter and it is perfect! The etching on the glass is magnificent and should outlive the jar! This was a gift for a friend. She really like it! Additional Details There's lots of summer picnic gear that you can get to make your gatherings super fun! And when the hot weather warrants a sweet treat - you'll LOVE enjoying it out of our personalized ice cream bowls!